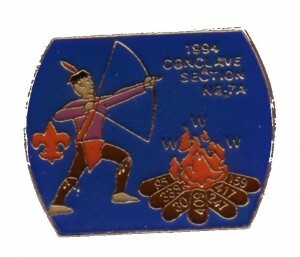 According to the OA Section List (and the conclave patch) the following lodges were in NE-7A at this time. Thanks to Andrew Kosmowski for the trade! In addition to the listed lodges, there was also a tiny (~4) contingent from Gajuka there. 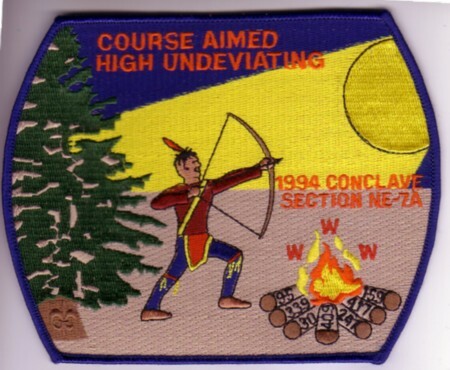 Perhaps because that lodge was to host with Ty-Ohni the 1995 3A/3B Conclave. However, you say short-lived. Of the sections since then, this was still the longest at 6 years, compared to the two that immediately followed it. Each of those had a length of 3 years. The one that just ended was longer at 8 years. Guess I’ve been spending too much time with the longer-lived Area and Sections (NE-2A, and NE-2C on the blog) than looking at the existence of the immediate predecessor and successor sections of NE-7A.